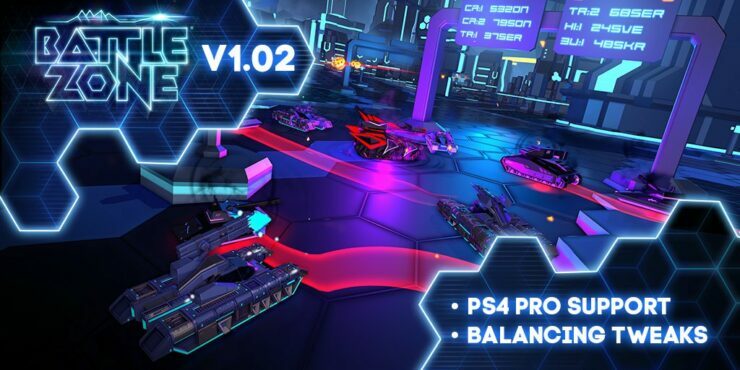 Rebellion just announced via press release that Battlezone just received support for Sony’s upcoming PlayStation 4 Pro console. PlayStation VR’s most exhilarating launch game is about to get even better on PlayStation 4 Pro! Rebellion is thrilled to reveal that BATTLEZONE supports PS4 Pro, offering a crisper, more vibrant experience, making piloting the galaxy’s most powerful tank feel even more real. The new BATTLEZONE 1.02 Patch, available now, adds PS4 Pro support, ready for the system’s launch on November 10th. The patch also brings a number of tweaks to the base game. Following great feedback from players, it features a number of balancing changes, particularly across the ‘EASY’ difficulty setting, as well as minor performance and bug fixes. The UK developer also mentioned that there’s “plenty in store” for the community to look forward to across the upcoming months and weeks, including free DLC. You can find the full changelog of patch 1.02 below. Battlezone is available now for PlayStation VR/PlayStation 4, at the full price of $59.99. We’ll have a review of the game shortly, so stay tuned if you want to know our opinion.